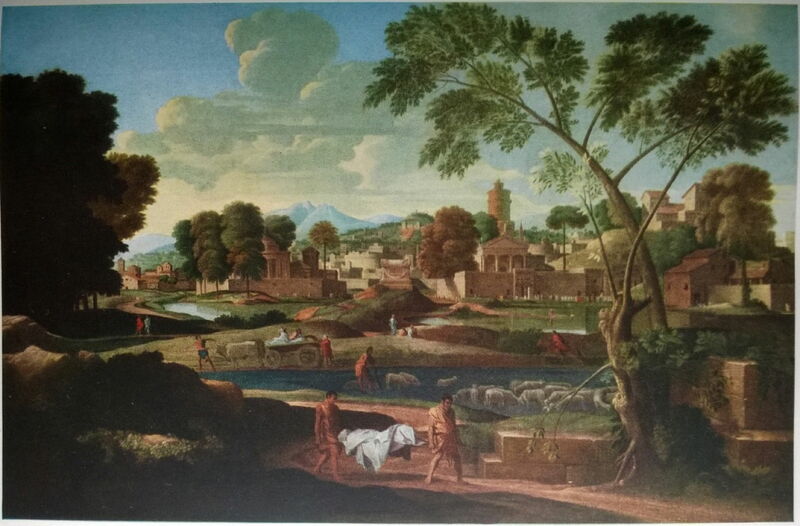 Nicolas Poussin (1594–1665), Landscape with the Funeral of Phocion (1648), oil on canvas, 114 x 175 cm, National Museum of Wales / Amgueddfa Cymru, Cardiff, Wales. Wikimedia Commons. Some are remembered for their achievements in life, others for the injustice of their departure from it. 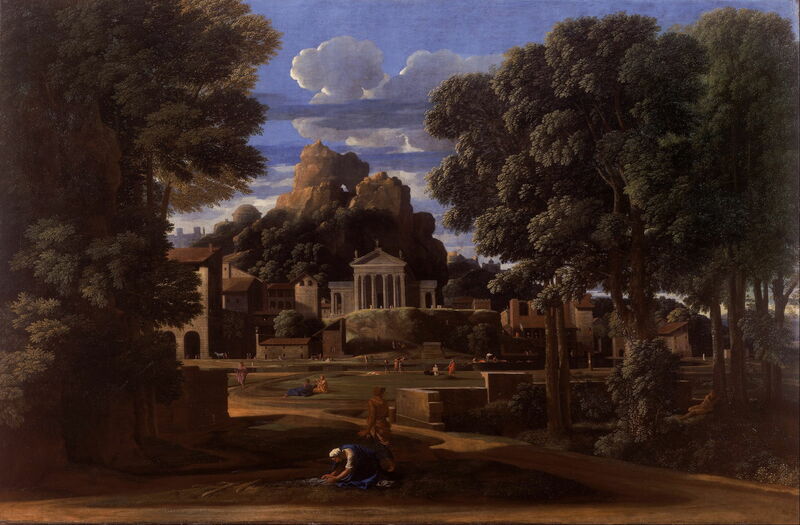 Those who know the works of Nicolas Poussin will recognise the name of Phocion, whose death was commemorated in two of the master’s wonderful narrative landscapes. It takes Plutarch’s account of Phocion’s life to understand why artists – and everyone else, perhaps – should remember his death so often. Plutarch’s biography of Phocion starts by explaining that he was in command of a shipwrecked state, and that in such circumstances the wrath of the people is all too often expressed quite unjustly on their leader. When Phocion was a young man, he followed the general Chabrias closely, from whom he gained his military experience. Phocion became recognised for his skills, and he was given command in a naval engagement off Naxos, which he fought with considerable success. He then went into public service, while often being made general of the Athenian forces. Indeed, Plutarch considers that Phocion was made general more times than any other man that he has known of: forty-five times he was so elected. Yet Phocion didn’t attempt to curry favour with the people, and spoke frankly, often opposing popular opinion. Plutarch recites a series of fables and sayings attributed to Phocion which confirm his independence of judgement and opinion. Phocion proved harsh, obstinate, and inexorable only insofar as was necessary to struggle successfully against those who opposed his efforts on behalf of his country. In all other matters and times, he was well-disposed to all, accessible, humane, and even helped his adversaries when they needed it most. Plutarch’s account of Phocion’s military career is necessarily hurried. It starts with a battle fought in Eretria, where Phocion had a small force but took possession of a commanding ridge, from where he captured an important fortress which controlled the island. After he had returned to Athens, his successor ended up being captured by the enemy. Phocion was then ordered to take a force to the Hellespont to aid the allies of Athens; this helped save Byzantium from their enemy King Philip. He went on to provide aid to the citizens of Megara, but was excluded from command during further conflict between Athens and the Macedonian King. Phocion was in support of the proposal for peace between the states, but refused to agree until its terms were known. Alexander once sent Phocion a gift of one hundred talents. When the bearers of this tried to give it to Phocion, he asked why he should be singled out to receive it. They replied that Alexander judged that he alone was a man of honour and worth, to which Phocion asked that he should continue to be so appreciated, so refused the gift. Phocion continued to refuse the money even when Alexander wrote to him personally. 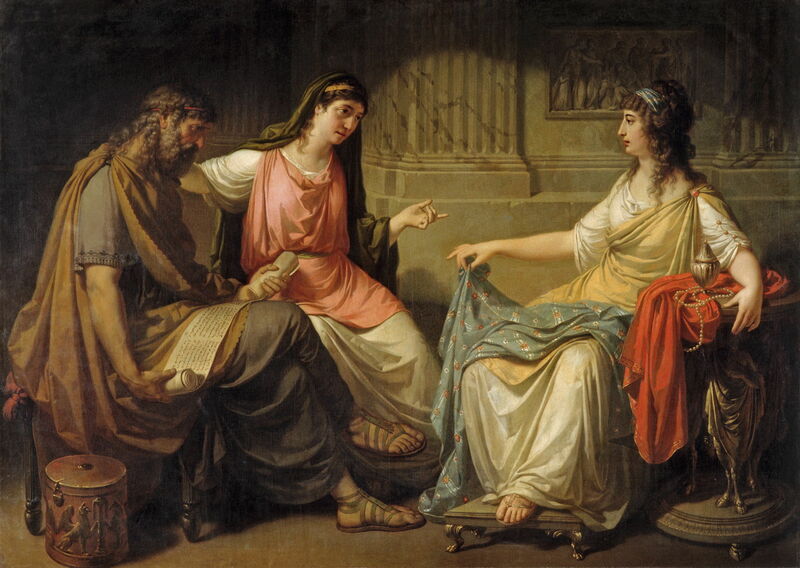 Franz Caucig (Franc Kavčič) (1755–1828), Phocion with his Wife and a Rich Woman (date not known), oil on canvas, 173.5 x 241 cm, Akademie der bildenden Künste Wien, Vienna, Austria. Wikimedia Commons. Athens was then plunged into the Lamian war. Phocion was very critical of this, warning that the city lacked longer-term military resources. At first, the city was very successful, driving its enemy Antipater away into Lamia. The Athenian general Leosthenes was killed, but instead of sending Phocion as commander, another was chosen. Phocion then opposed making an expedition against the Boeotians, and was warned that he risked being put to death by the Athenians if he offended them further. Phocion was responsible for negotiating a truce with Antipater, which concluded with the city of Athens having a Macedonian garrison under the command of Menyllus, who was equitable and a friend of Phocion. After Antipater’s death, Cassander staged a coup and sent Nicanor to relieve Menyllus of his command at Athens. Antipater’s general, Polysperchon, conspired to seize power by thwarting the schemes of Cassander. To assist in that, Polysperchon needed Phocion out of his way. Phocion was denounced as a traitor, and Polysperchon ordered him to be seized, tortured, and put to death. With his friends, he was taken back to Athens ostensibly to be tried, but had already been sentenced to death. Phocion was given no opportunity to defend himself when tried in front of a rabble. He asked the crowd whether they wished to put him to death unjustly or justly. They replied “Justly”, to which he asked how they would determine that without hearing him first. He wasn’t allowed to make himself heard again, until he admitted his guilt but denied that of his friends. The crowd insisted that they too would be put to death, merely because they were his friends, and voted to put them to death. They were then given hemlock to drink by the executioner. However, there was insufficient left for Phocion, who had to arrange for a friend to pay for more hemlock so that he too could be executed. Charles Brocas (1774–1835), The Death of Phocion (1804), oil on canvas, further details not known. Wikimedia Commons. In 1804, The Death of Phocion was the subject for the prestigious Prix de Rome competition. Charles Brocas’ unsuccessful entry shown above gives Plutarch’s account very clearly. At the right, Phocion’s friends are dying as they drink their goblets of hemlock. In the centre, Phocion is arranging for the payment of the executioner so that he too can be killed. Behind Phocion stands another man, pointing to the empty bowl into which the hemlock plant was to be put to make the infusion. Joseph Denis Odevaere (1775–1830), The Death of Phocion (1804), oil on canvas, dimensions not known, École nationale supérieure des beaux-arts, Paris. Image by VladoubidoOo, via Wikimedia Commons. The winner that year was Joseph Denis Odevaere with this painting. 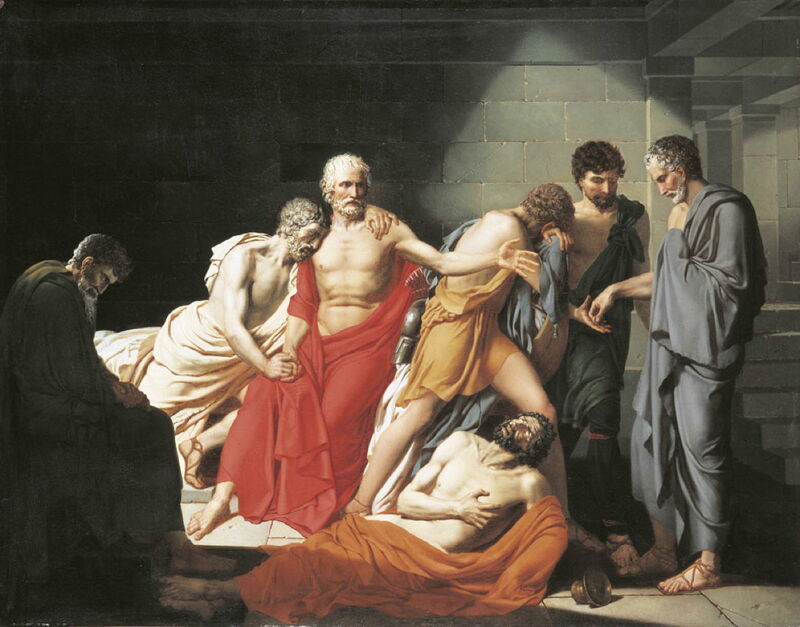 Phocion stands in the middle, comforting his friends as they die. At the right, the executioner is being paid for the additional supply of hemlock. Phocion’s enemies got a decree passed that his body had to be carried beyond the boundary of the country, and that no Athenian could light a fire for his cremation. A man was hired to carry Phocion’s body beyond Eleusis, where it was cremated. Phocion’s wife was present, and built a small memorial at the spot. She then carried his remains by night to her house, where she buried them in her hearth. Nicolas Poussin’s painting of Landscape with the Funeral of Phocion from 1648 is thought to be the version which is now in Cardiff, Wales (above), although a later copy (below) is now in the Louvre in Paris. In the foreground, two burly men are carrying a stretcher on which Phocion’s body is being carried out of the country. Behind that are the many little sub-stories: a horseman in red making haste with a message, a cart being guided along a rutted track, and crowds outside a strangely Graeco-Italianate building. After Nicolas Poussin (1594–1665), The Funeral of Phocion (date not known), oil on canvas, 119 x 169 cm, Musée du Louvre, Paris. Wikimedia Commons. 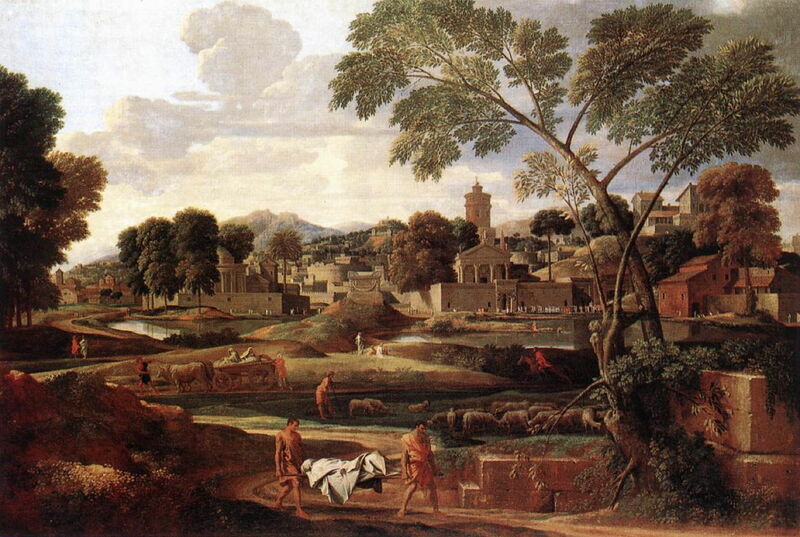 Poussin painted its companion in the same year, in his Landscape with the Ashes of Phocion (1648). Phocion’s widow is here gathering his ashes to take back to her hearth, as her maidservant anxiously keeps watch. Although less rich in narrative vignettes, the landscape here is particularly wonderful, with the trees echoing the form of the skyline. Not long after his execution, when the people had returned to their senses, a bronze statue of Phocion was erected in Athens, and his remains were given a public burial. 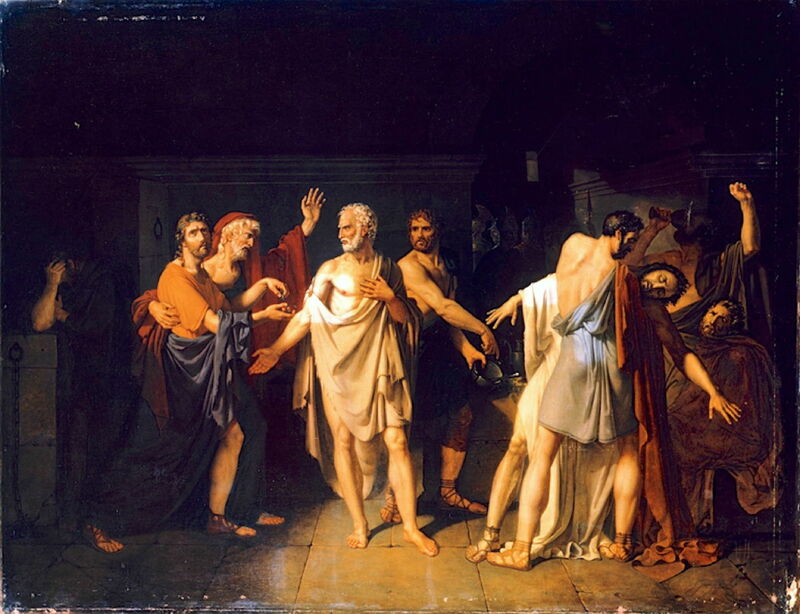 Phocion’s fate reminded the Athenians of what the people had previously done to Socrates. Phocion, whole text in English translation at Penelope. Posted in General, Life, Painting and tagged biography, Brocas, Kavčič, narrative, Odevaere, painting, Plutarch, Poussin. Bookmark the permalink.